The town of Marlborough has long been a Hudson River town with no public access to the river. With TPL's help, that has changed in early 2010 with the purchase of a 14.5-acre property along the river. Located in the neighboring hamlet of Milton, the property was an industrial site used for petroleum storage for more than 60 years. Owned by Suburban Propane, the site's access to deep water allowed large ships to connect to fuel up from storage tanks located on the upper part of the property. In 2001, the terminal and storage facility were dismantled, and the storage tanks were removed. After completing environmental remediation based upon a plan approved by the Department of Environmental Conservation, the company decided to sell the property. 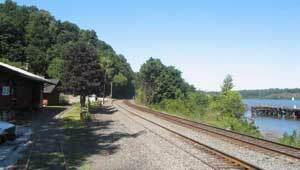 This new community asset is adjacent to the town's Milton-on-Hudson Train Station Park. Milton Riverfront park has panoramic river views and offers hiking and boating opportunities. The property was transferred to the town on the 400th anniversary of Henry Hudson's voyage up the river. Partners: Town of Marlborough, Scenic Hudson, New York State Office of Parks, Recreation, and Historic Preservation (OPRHP), New York State Department of Environmental Conservation, Land Trust Alliance.